Naperville Therapist: Life Synergy, LLC - Therapist 60540. Send A Message To Life Synergy, LLC. 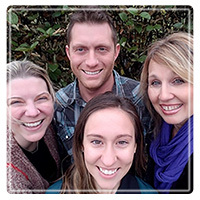 We are a dynamic, passionate group of therapists who provide hope and positive change for all populations in the Chicagoland area and beyond. Each therapist has their own specialty whether it be with children, tweens, adolescents, adults, or golden year adults. Our counselors' expertise include, anxiety/depression, addiction, alcohol and substance use, relationship and family problems, anger management, chronic illness, self harm, sexuality, and career issues, in addition to a vast number of other life stressors. Online therapy and career counseling via phone or video-conferencing is also available. Get to know our friendly, compassionate counselors by reading a little more about each one of us! Karen shares her energetic nature by connecting with people through her life and career experiences. She incorporates a warm approach coupled with open-heartedness as well as humor in making people feel comfortable sharing sensitive topics. She is passionate in her work with individuals, couples, families and groups. Along with her focus in psychotherapy and counseling, she holds professional certifications in addictions as well as in life/career coaching. Additionally, Karen serves as a speaker/presenter in the community on health topics as well as an adjunct faculty at the University of Francis. Karen's positive, empathic, uplifting nature is contagious to everyone she encounters. Erik's focus is working with adults who struggle with anxiety, depression, low self-esteem, indecisiveness, and relationship issues. His genuine caring stance is invaluable to all individuals who cross his path. In addition to his passion for helping individuals, couples, and families reach their fullest potential, Erik brings an added component of health, exercise, and fitness from his own personal experience. He specializes in anger management and life transitions while offering coping strategies utilizing various therapy methods, including Cognitive Behavioral Therapy. Erik is known for his dedication to mental and physical health through self-awareness, exercise, and healthy eating patterns. BiBi specializes in helping children, tweens, adolescents, as well as families and individuals to develop self-confidence, cope with anxiety and depression, isolation, loneliness, and eating disorders. She is especially skilled in Dialectical Behavioral Therapy and provides coping skills and emotional support to parents and children. Her focus is to help individuals achieve self-acceptance, create a healthy relationship with food, along with overcoming issues related to self-harm and trauma.Through creative expression, BiBi helps individuals improve self-esteem and build on achieving a healthy life balance. BiBi's welcoming smile and youthful spirit helps people feel instantly at ease as they begin their self-discovery process. Amy works with adolescents, adults, and elders in the areas of anxiety, depression, grief and loss, self-harm, chronic illness, trauma, and sexual identity. She specializes in social skills, motivation, life transitions, and LGBTQ+ concerns. Her approach focuses on exploring what makes each individual thrive, providing empathy and understanding, free from judgment and societal expectations. While life can bring about challenging life events, Amy is highly skilled in helping individuals navigate change while developing coping skills to enhance overall well being. Amy is a mentor for resilience and her non-judgmental and open-minded approach is precious to many.